Are you looking for the best things to do in Delft, The Netherlands and an itinerary for spending one day in this beautiful city in Zuid-Holland? Keep on reading! 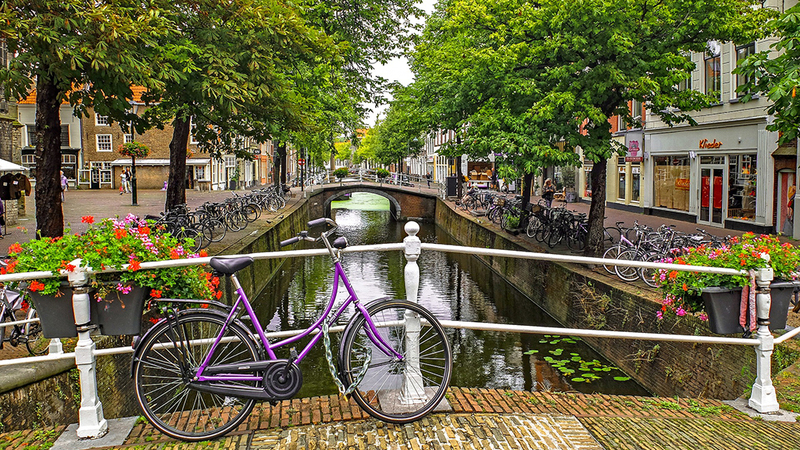 If you’re looking for the best things to do in Delft, The Netherlands, keep on reading. Find what to do and how to spend one day in Delft here. Delft is a beautiful city in the province of Zuid-Holland, The Netherlands. In Dutch Delft has the nickname Prinsenstad or prince city. Delft is the city of the Dutch Royal Family, called the Oranjes. It started all back in the 15th century when Willem van Oranje lived and was murdered in Delft. Now, if you think everything in Delft is connected to the Royal Family, that’s not the case. But there are some special sights that have a connection to the Dutch Royal Family. 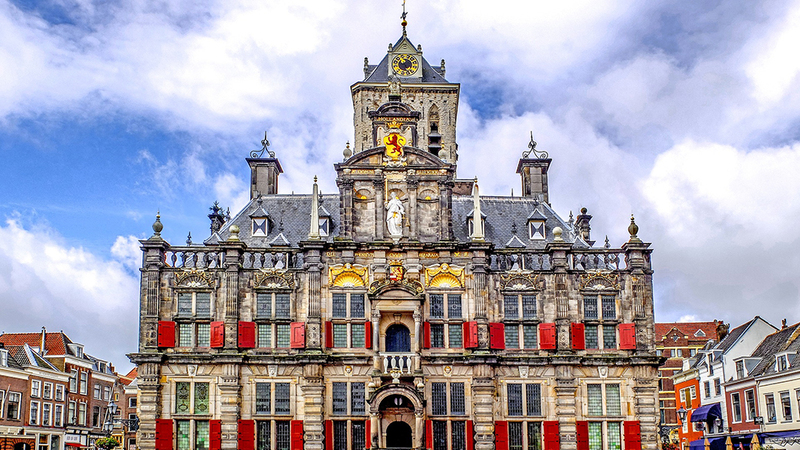 Here you will find a complete itinerary to one day in Delft, The Netherlands. There are plenty of attractions that you can and should visit in Delft. 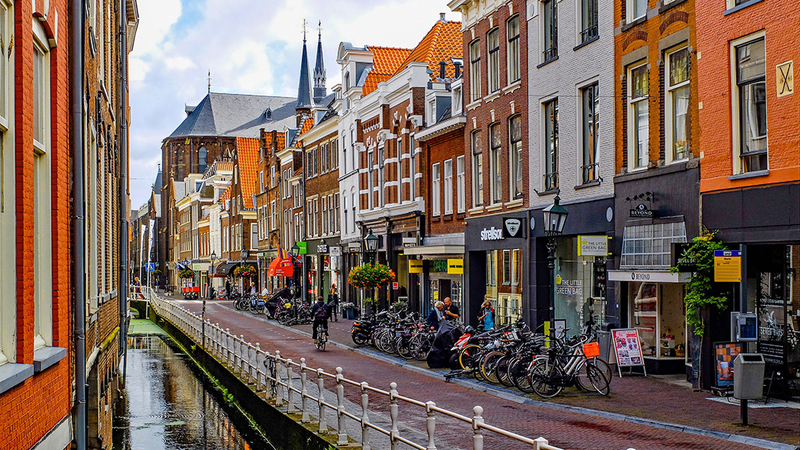 However, for spending one day in Delft I personally think that the activities below are a good way to get an introduction to this gorgeous city. You cannot start the day in Delft without a good breakfast. One of the best, and cutest, breakfast spots of Delft is Bij Best. Bij Best can be found in one of the small streets behind the Nieuwe Kerk (New Church). The best part? Bij Best serves breakfast the entire day. You can find amazing street food, fresh juices and plenty of more. But what makes Bij Best truly special is the fact that they incorporate the Indonesian kitchen in their food. So, if you’re looking for good places on where to eat breakfast in Delft, then bring a visit to Bij Best. Click here for the website of Bij Best for more information. 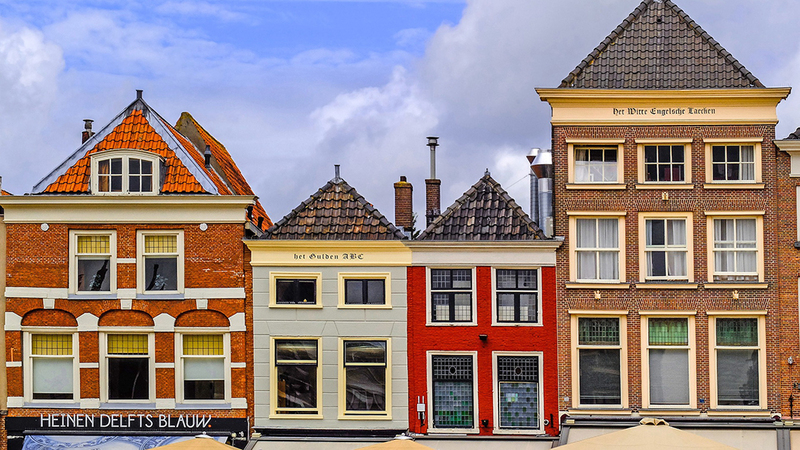 As Delft is one of the many beautiful and old cities in The Netherlands, that means you find pretty canal houses, gorgeous streets, many monuments, and beautiful looking canals. Here you can find a walking tour that you should walk to explore the most beautiful streets and monuments of Delft. This way you can explore Delft, like a local and off the beaten path. The tourists that visit usually don’t go further than the markt square and one of the Delft porcelain shops and museums. Achterom, Bagijnhof, Beestenmarkt, Binnenwatersloot, Boterbrug, Brabantse Turfmarkt, Breestraat, Burgwal, Choorstraat, Heilige Geestkerkhof, Hippolytusbuurt, Jabod Gerritstraat, Kerkstraat, Kolk, Lange Geer, Paardenmarkt, Nieuwstraat, Noordeinde, Oosteinde, Oude Kerkstraat, Oude Langendijk, Papenstraat, Phoenixstraat, Pluympot, Rietveld, Verwersdijk, Vlamingstraat, Voldersgracht, Voorstraat, Vrouwjuttenland, Vrouwenregt, Westvest and Wijnhaven. Oostpoort: This is the only city gate that Delft has left. It dates back to the 1400s and can be found at Oostpoort 1. Kleine Oostpoortbrug: In front of the city gate of the Oostpoort you will find a beautiful bridge. This was part of the Oostpoort in 1514. Stadhuis (city hall) can be found at markt 87. It was first built around the year 1200. It was rebuilt, burned down and eventually reconstructed in 1629. When I’m in a new city, I need to know what the city and surrounding looks like from above. If you’re like me, keep on reading. And if you want to know where the best view of Delft can be found, continue as well. 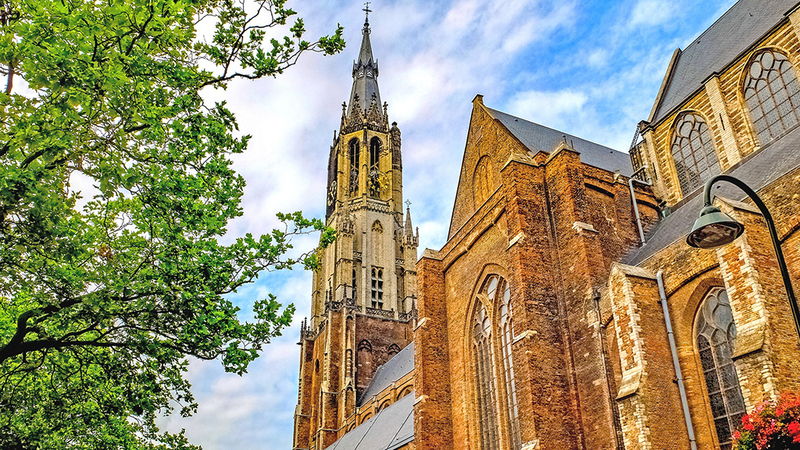 Visit the Nieuwe Kerk (New Church) as the 85-meter tower will give you the best view of Delft. And if the weather is great, you can even see Rotterdam and Den Haag (The Hague). From the tower, you will look at the markt, the city hall and much more. But if you want to climb the tower of the Nieuwe Kerk you have to be physically fit, as there are 376 stairs. The Nieuwe Kerk dates back to the 1300s, so it’s not that new anymore. Besides the tower, I find the Nieuwe Kerk very interesting because of its history. You will find the royal tombs at the Nieuwe Kerk where almost every member of the Royal Family eventually find its peace. Although you cannot enter them, and which members exactly lay in those graves is unknown to the public, this makes it an interesting mystery. The Oude Kerk (old church) dates back to around 1050 when it was only a small church. It has beautiful, typical, old Dutch glass windows. And is also beautiful to visit, although the Nieuwe Kerk is more special. Adults: For combi tickets of the two churches and the tower, 8 euros. Only the churches 5 euros. Tower 4 euros. Young adults under 25: Combi ticket is 5,50 euros. Tower 2,50 and the churches 3,50. There is a student discount if you have a legit student id. One ticket gives you entry to the old church as well, Oude Kerk. The church tower of the Nieuwe Kerk closes one hour before the church. If the weather conditions are not good, the tower remains closed. Courtyards, or hofjes in Dutch, can be found all over The Netherlands. In big and small cities. They were extremely popular in the 17th century, so logically Delft has them as well. Here you can find the courtyards in Delft that you should visit. This courtyard dates back to 1607 and was a gift from the sister or a mayor. She gifted her home to virgins and maidservants. Elisabeth Pauw was the daughter of a mayor of Delft but never had any children in her lifetime. So, she wrote in her testament that a hofje should be built with the money she left behind. It was built in 1707 and exists out of 8 houses. This courtyard in Delft was built by the owners of brewery De Klaeuwe in 1603. The courtyard exists out of 12 small houses and a big house for the founders of the courtyard in Delft. One of the best museums in Delft is Museum Prinsentuin. 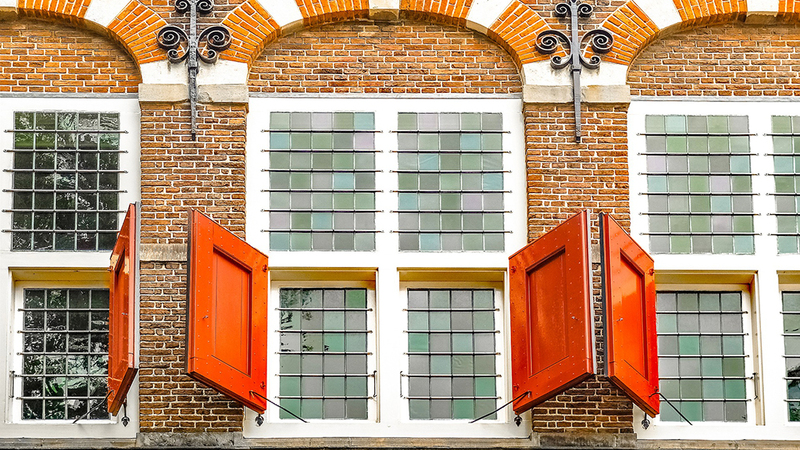 This museum cannot miss on your one-day itinerary in Delft. Here you will find a beautiful collection of art and ‘Delfts Blauw’. Besides that, you will learn everything about the history of Delft and will see the bullet holes of the murder on Willem van Oranje. He was murdered in De Prinsentuin, which was his own house, on the 10th of July 1584. The body of the prince can be found in the Nieuwe Kerk, where he rests in the Royal grave chambers. Don’t forget to visit the beautiful garden of the museum. As you’re in the area anyway, visit the art gallery of Het Prinsenkwartier. It’s located next to the Museum Prinsenhof. Het Prinsenkwartier in Delft is a centre for the creative industry. Here you can find several expositions, debates and plenty more things to do. What I love about Het Prinsenkwartier is the fact that you’ll see all sorts of people. `so many different age groups and types of people that walk through the expositions. Winkeltje Kouwenhoven is part of Museum Prinsenhof Delft and is located next to the museum. This cute, little shop is an authentic shop that sells typical Dutch nostalgic products. The interior is more than hundred years old and makes this shop one of the cutest shops of Delft that you should bring a visit. You can buy old Dutch candy, toys, books and much more. Winkeltje Kouwenhoven is opened on Sunday every second and fourth week of the month. One of the best lunch cafes in Delft is Kek. This is a coffee bar and also very famous for latte art. The atmosphere feels cosy and homey, but most importantly, the food at Kek is also very good. No matter what time of day it is, it’s always time for good food at Kek in Delft. Here you can find one of the best organic lunches of Delft. So, if you’re looking to be environmentally friendly while travelling through The Netherlands, visiting Kek is a great idea. Take a seat at one of the benches at the window and I can assure you that the hours will pass by. One little thing, the menu of Kek changes very often which makes it one of the best lunch spots in Delft for me. I like lunch restaurants that change it up. De Porceleyne Fles is the only Delft blue pottery factory left. And it has been constantly used since 1653, in the 17th century. This factory still makes the Delft porcelain, but the best part is, you can go for a factory tour. 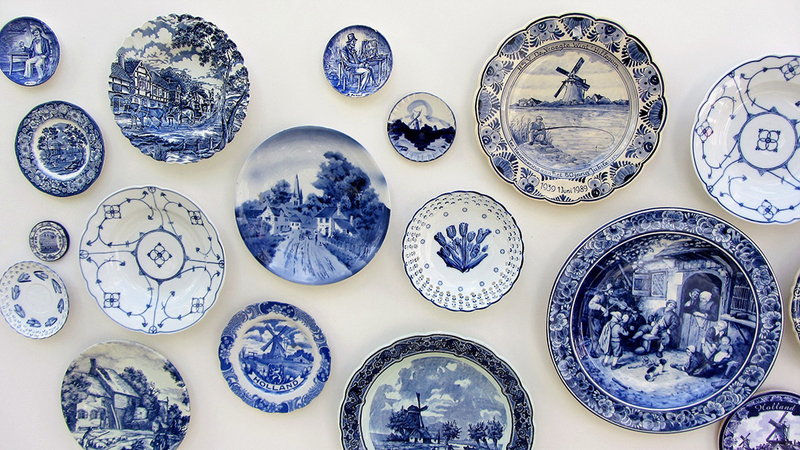 At this Royal Delft pottery factory, and museum, you will get to know the history of the Delft blue pottery. Besides that, you will see historical items, can get a factory tour and can even buy some Delft blue pottery. There’s an audio tour, beautifully painted pieces of Delft porcelain as the Nachtwacht, and plenty of more. Keep in mind that on Sunday no employees are working. So if you want to see the employees work on the Delft porcelain, then visit this factory on other days. Don’t forget the garden at the factory. The entrance is still the same as in 1653 and the garden is lovely. If you buy your tickets online, you’ll get a 1 euro discount. Royal Delft is located just outside the centre of Delft. It’s a 20-minute walk from de Markt and 15-minute from the Delft train station. Otherwise, they are a few bus stops nearby as well. Click at this link for more information about visiting Royal Delft. One of my most favourite things to do, no matter what city I visit, is to look for botanical gardens. And you’re in for a treat. Delft has a beautiful botanical garden, called Hortus Botanicus Delft. And it is one of the things you have to see in Delft. This is not one of the oldest botanical gardens of The Netherlands, as it’s been established in 1917, but still, one you have to visit. It is part of the TU Delft, which is one of the best technical universities of The Netherlands. What I love about botanical gardens is that they are a quiet space in a bustling city. 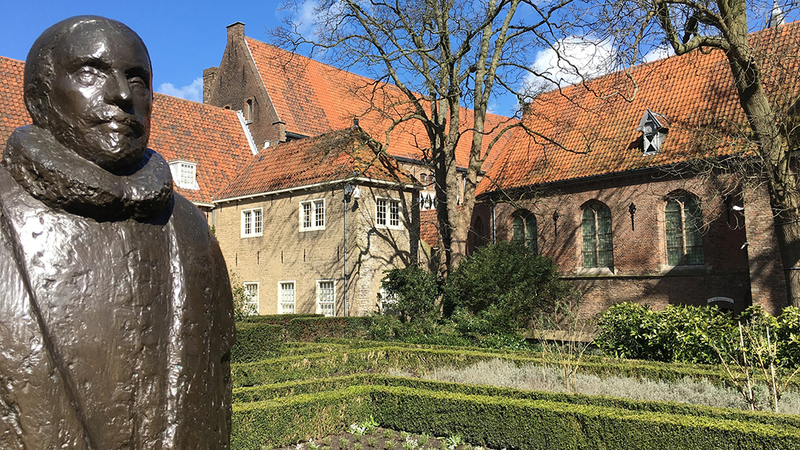 Delft is a city that is renowned for having a big student population, so it’s great to ease and relax your mind in the Delft Hortus Botanicus. That makes visiting the botanical gardens one of the best things you can do in Delft. The whole garden is bigger than you’d expect, so definitely worth an attraction that you should visit when you’re in Delft. You can buy tickets in the museum shop. 1st of January, King’s Day 27th of April, 1st and 2nd Christmas Day, 31st of December. Map of the botanical garden of Delft. One of the best places to go vintage shopping in Delft is Vintage Island. Although this is a typical vintage shop with brands such as Levi’s you will find whatever your heart desires. This vintage shop has several other locations through The Netherlands. But it will still make your vintage heart flutter in happiness. The next vintage shop you have to visit in Delft, which is one of a kind, is Offline is the New Black. This shop is a mixed store, so not completely vintage. It has a lot of designer vintage clothing, handmade jewellery, furniture, and Dutch design. They sell products from young Dutch designers and believe in a mixture of old and new. The vintage clothing comes from France and the jewellery is made in the same shop. This store is one of my most favourite spots of Delft if I want to find some different clothing than the big brands such as Zara and H&M. One of my most favourite restaurants in Delft is The Living. The Living is one of the best restaurants in Delft, but it’s slightly different than you would imagine. The Living is a takeaway and has a few seats, but no toilets. Why do I recommend this restaurants/ takeaway in Delft then? Because at The Living you pay for your food in weight. 2,15 euros per 100 grams and 3,50 euros for a soup portion. The reason they do that is because at The Living they want to reduce food waste. They also only have products with the smallest ecological footprint. That means if you’re looking for a vegan or vegetarian restaurant/ take- away in Delft, The Living is your spot. Around 80% of their food is vegan and everything is 100% vegetarian. The menu changes every two weeks. Steck is one of the best places for live music in Delft. The atmosphere is great and so is the music. If you want to relax after a busy, long but exciting day, you have to visit club/ bar Steck in Delft. In my opinion, it’s not only the best place for live music but also one of the best bars of Delft. You will find anything from 90’s music to jazz and Dj’s. If you’re not into dancing but just fancy some beers or cocktails in Delft, don’t you worry. Without dancing, you’ll be perfectly fine at Steck as well. From Amsterdam: The easiest way to get from Amsterdam to Delft is by train. Take the train from Amsterdam Centraal in the direction of Vlissingen. Get out at Delft train station. This will take you around one hour. From Rotterdam: The best way to get from Rotterdam to delft is by taking the train from Rotterdam Centraal. Get the train in the direction of Amsterdam Centraal or Den Haag Centraal. Get out at Delft. This will take you around 15 minutes. From The Hague: If you want to travel from The Hague to Delft I would also recommend you to take the train. Take the train from Den Haag Centraal in the direction of Eindhoven or Dordrecht. Get out at Delft. This will take you around 12 minutes. Disclaimer: These links are affiliate links. This means that I get a little commission when you book through these links at no extra cost to you. Click here for the full disclaimer. Hostel Delft, click here for the availability. Hotel Grand Canal, click here for the availability. B&B Gasthuis 288, click here for the availability. Hotel de Emauspoort, click here for the availability. Casa Julia, click here for the availability. This itinerary to spending one day in Delft is pretty packed. So, don’t worry if you’re not able to do all these great things in Delft, as long as you’re enjoying yourself and the city, that’s all that matters. 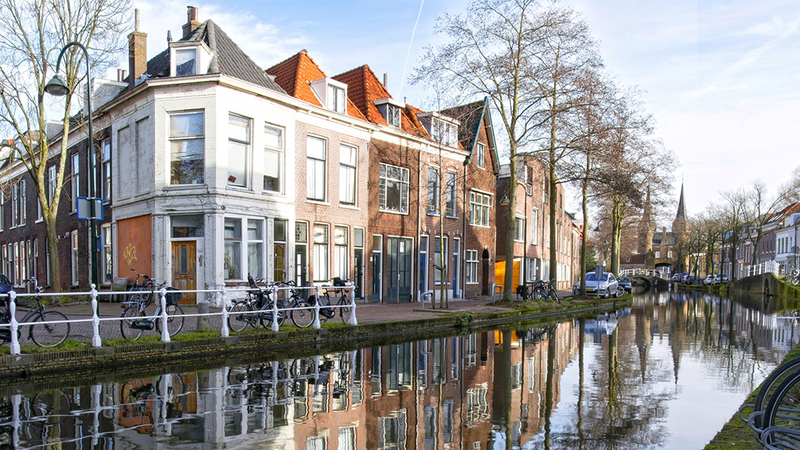 If you’re not into vintage shopping, scratch that, if you’re a fast traveller you might do all these attractions in Delft. Travel how you like. I hope this article was useful again. Click here for all my other articles about The Netherlands. Share this post! !